PC720 6860 was introduced to the market together with PC750 6886 in 1995. 6860 is not a Pentium based PC. IBM Japan didn't introduce PC730 6876 in Japan but, instead of introducing PC730, they made this unique, space-saving desktop model. PC720 6860 is a strange * Hybrid* PC with one MCA slot, one MCA/PCI shared slot and a ISA-ish slot for PCMCIA /A exclusively designed for this box.. Type JZG was equipped with a PS/55 Display Adapter /NI-J and DOS J5.02Z ( JDOS ) . 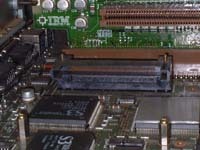 Model 6869 is an ISA version of PC720. Model 6863( also ISA ) is named as "PC720" but it's a Pentium machine with P-100. different from that of 6885/6886 or 6887 ). J2 is silk screened as "IR/PCMCIA". It is obvious that PCMCIA meant for 2nd PCMCIA device which should be installed at front end. I long time believed that IBM had just planned to develop such a device and they did not make it until I got 6869-J4K ( ISA DX4-100 model which is not listed in my PC GUIDE BOOK ) . J4K has additional PCMCIA slot just below FDD bay which you can see in the picture at the top of this page. Next question is what does "IR" mean ? Is it for IrDA device and is there such OBI ever released for PC720 ? 6860 is not an IML machine but it does support service partition ( reference partition ? ). My 6860 takes long time till set-configuration page comes on the screen when I boot the system with the Reference Diskette. It stays quiet while it reads configuration files as if the system halt. But from service partition stored in hard drive it goes straight into configuration menu. Planar can take a DX2-66, DX4-100 or PODP5V83. No interposer required to use 3.3V CPU's . In order to use PODP, BIOS should be updated to KOJT66JP. See below. PODP Support Diskettes Kit is consisted in 3 programs. 6863/6869 (and it may be for Win95A ). For 5V CPU ; Close 2x3 jumper blocks near to the PSU connector. For 3.3V CPU: Close 2x3 jumper blocks near to the CPU socket. J19 : purpose unknown. default is 1-2 closed. J51-J54; Default setting for these jumpers are all 1-2 closed. Planar takes 4, 8,16, 32MB, 70ns, FP, parity modules. Only one IDE channel is provided. There are solder pads for 2nd IDE channel on the planar. Even if the 2nd channel can be activated there is no room for 3rd IDE drive. The drive interface is EIDE and it can handle drives larger than 524MB. ( It could read and write a Seagate 6.4G drive with 15heads. I once used it ). Hard drive runs in MS-DOS compatibility mode under Win95. IRQ value fixed to 15. Change the configuration to #0 which has IRQ 14, all drives will work properly. # 85G7285. I have a 4x slim drive for Toshiba laptops. Same socket as 9577i or 9585 is used. M70/80 PowerBoard. To say the truce I bought my 1st 6860 in order to get a cache module in it. DX2-66 model does not have a L2 cache socket. I have not ever seen this type of connector in any other PCs including AT clones. IBM Japan made only 2 adapters for this interface. 2) SFF PCI TokenRing card ; C/R ? equipped in 6860-J04. I want to see it! Enable/Disable selector for PS/55 display adapter. Outline below is the one for models other than -JZG. S3 Vision 864 1MB ( 2MB for J4G model ). Win95 recognize the chip with it's built-in driver. with pre-installed DOS J5.02/Z ( specialized DOS J5.02 for this model ). 2 slot PCMCIA /A with ISA style connector is equipped in all models. ISA models ( 6869 and 6883) also use same adapter. Win95 built in driver can't handle this adapter properly on MCA models but the very same adapter installed in ISA models can be used without any problem under Win95B or Win98. modem card. I've been using a 28.8Kb Double Jack Modem Card under Win95B. Regular power consumption ; 40W. 6860 has very unique PSU. Cooling fan will slow down running if the total system power is lower than 50W, and will stop to work lower than 30W. Thus the cooling fan usually stays idle. When I got a 6860 ( second handed as usual ) I immediately noticed that the fan didn't work at all. As I didn't know this unique feature I thought there would be some defects on the circuit board of the PSU. I disassembled PSU and soldered 12V line directly to the fan assembly. Latter on I was advised above unique function. The jumper wire is still there. Some machine have input AC voltage selector. Well, mine has a "fan mode selector"; summer mode with direct connection and winter mode with original connection. appears on the screen. I solved this symptom modifying MSDOS.SYS to have a start up menu with default boot for Win95 after 60 seconds of delay time to boot. Maybe mine needs some intervals for stable DC output for planar, a hard drive and a CDROM. I'm sure that this symptom is not related to above fan cable modification 'cause I have same problem when I switch back to original cable connection .